What Is the Beef Rib Primal Cut? The beef rib primal cut is where we get some of the most tender, flavorful and generally desirable steaks and roasts. 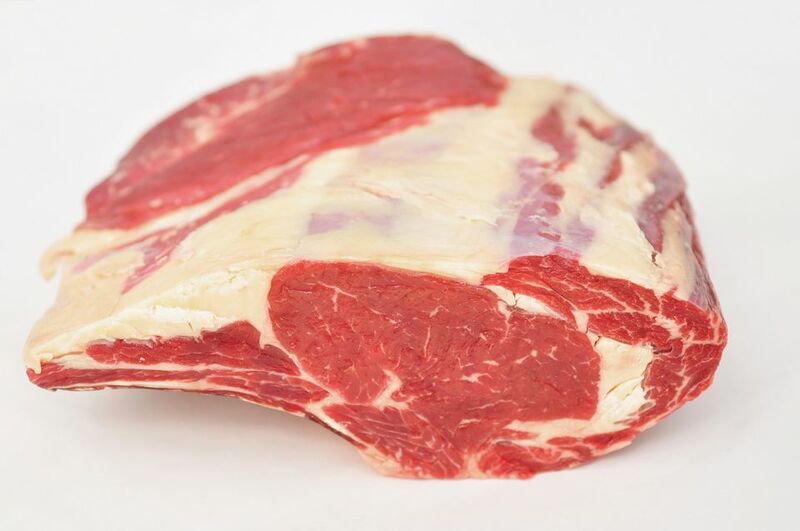 The main muscle in the beef rib is the longissimus dorsi, or rib eye muscle, which is situated high up on the back of the animal, where it doesn't get much exercise, so it yields some of the tenderest meat. It can develop excellent marbling, which imparts moisture and flavor to the meat. The degree of marbling visible in the ribeye muscle specifically is one of the most important factors in grading beef. More marbling means a higher grade. The beef rib primal comes from the beef forequarter, where it's separated from the beef chuck between the 5th and 6th ribs, and from the loin between the 12th and 13th ribs. Thus the rib primal consists of the 6th through the 12th ribs (7 ribs in all). The rib primal is separated from the beef plate primal by sawing across the ribs a few inches down from the pointy end of the ribeye muscle. How far down depends on a lot of things. Technically a full beef rib primal will have ribs that are up to 10 inches long toward the chuck end, and six inches long at the loin end. But what often happens is that the ribs are cut short, anywhere from two to four inches below the ribeye muscle. Whether they're cut short or long, the remaining section of rib bones, all the way down to the sternum, is called the beef plate primal. That's where beef short ribs come from, and the distinction between them as being part of the rib primal or the plate primal is a somewhat arbitrary one. In short, the beef rib primal is what's left of the beef forequarter after the beef chuck and the beef plate are removed. After removing the backbone and associated cartilage, you have what's called a roast-ready beef rib, which can be used for making classic bone-in prime rib roasts or sliced into individual bone-in ribeye steaks. You tend to see a lot of bone-in ribeye roasts around the holiday season, for making the classic prime rib roast. There are a number of different iterations of this roast, depending on how it's trimmed, how much of the exterior fat layer is removed and so on. A great way to prepare this roast is to peel away the exterior fat layer, trim away the outer muscles, and then replace the layer of fat and tie it on with string. The rib bones and this outer fat contribute flavor and moisture, making this the ideal prime rib roast. It's not easy to find a rib roast prepared this way, but you may be able to order it from your butcher. Bone-in ribeye steaks are pretty easy to find all year long, especially at restaurants. Some steakhouses serve what's called a Cowboy Steak, which is basically a bone-in ribeye with a long section of bare rib bone extending from it. If you've ever had beef back ribs at your neighborhood BBQ joint, you've probably noticed that there was hardly any meat on them. And now you know why. Butchers want to leave as little meat on the ribs as possible because beef rib eye sells for a lot more per pound than beef back ribs. Thus, meaty beef ribs are pretty much an oxymoron. You're really talking about whatever meat there is between the rib bones. Since beef ribs aren't a high-demand item, the meat between the ribs (called intercostal meat) often simply ends up being removed and used for making ground beef. What Does Beef Primal Rib Taste Like? The meat from the primal cut is very tender because of its high degree of marbling. The rib primal cuts are best for grilling, roasting, searing or frying but not for slow cooking. For the most part, you're going to see boneless rib eye steaks and roasts, which means the butcher will remove the ribs entirely. Once the ribs and outer muscles are removed, you have what's called a boneless ribeye roll, which itself can be further trimmed down by removing the ribeye cap. The rib eye cap can be stuffed, rolled and roasted, or it can be portioned into individual steaks. However, most of the time it's left attached to the ribeye. The rib eye lip (sometimes called ribeye tail), consisting of the longissimus costarus and the serratus dorslis, can also be removed or left on, and it's usually left on because there's not much you can do with it once it's off except grind it up. Keep uncooked beef cuts in the refrigerator in butcher's paper or their original supermarket packaging (aka "modified atmosphere packaging" for the carbon dioxide content that preserves the meat.) You can freeze uncooked beef for up to a year, but make sure you seal the package in an airtight container or freezer paper and label it with the date. Cooked meats will last up to four days in the fridge. Beef Tenderloin: Tender and Tasty? What Is a Sierra Steak and How Should You Cook It?